John Hill-Daniel creates images of natural forms, twice-mirrored to create imaginary worlds for the viewer to explore. The City of Birmingham Symphony Orchestra is the flagship of musical life in Birmingham and the West Midlands – and one of the world’s great orchestras. Based in Symphony Hall, it gives over 130 concerts each year in Birmingham, the UK and around the world, performing music that ranges from classics to contemporary, film music and even symphonic disco. With a far-reaching community programme and a family of choruses and ensembles, it’s involved in every aspect of music-making in the Midlands. Some cold stark beauty in the deep midwinter. Find out more and view products sold for the benefit of The ME Association. 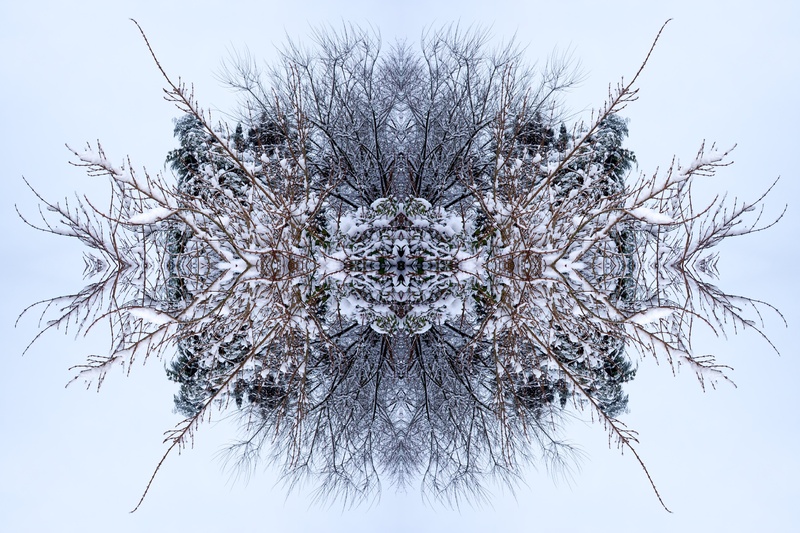 Twice-mirrored images of trees in blossom. Digital Prints in editions of 16.